Yes I know, I slumped on reviewing April’s reads. (I did read during April!) It was a busy month at work, and I wasn’t as diligent about taking notes during my readings as I learned to be this past month, which turned out to be equally busy. June, however, will be still busier, so note-taking-while-reading will become twice as important. As I told a friend, when I read, I want to lose myself in the story. Taking notes makes it harder to feel subsumed, although I did find that taking pictures while reading helped me “bookmark” interesting passages to come back to during blogging. There’s also a balance between reacting to a particular passage, vs. an entire scene, vs. a whole story. In any case, this month I’m celebrating the acceptance of one of my favorite short stories to have written (“Liliya and the Lost Relics of Bygone Futures,” a Chernobyl-themed Baba Yaga retelling appearing in about a month in Soft Cartel) by exploring Area X and the Zone: the worlds of Jeff VanderMeer’s Southern Reach trilogy, and the Strugatsky brothers’ Roadside Picnic. In Annihilation, we step into a familiar-yet-alien landscape alongside an unnamed biologist, whose job it is to observe and document her findings, including her own transformation. Together with “Control,” in Authority we’re left out of sync, trying to put puzzle pieces together that don’t quite fit. In Acceptance, we become “in and of” Area X and see how it (re)shaped multiple characters from the first two books, as well as the world they — and we — took for granted. There were thousands of ‘dead’ spaces like the lot I had observed, thousands of transitional environments that no one saw, that had been rendered invisible because they were not ‘of use.’ Anything could inhabit them for a time without anyone noticing. We had come to think of the border as this monolithic invisible wall, but if members of the eleventh expedition had been able to return without our noticing, couldn’t other things have already gotten through? In fact, I first started to read Acceptance on a field trip to the coast with my son’s 5th grade class. The St. Christopher Camp & Conference Center’s Barrier Island Environmental Education Program is located in the “pristine wilderness” of (mostly) undeveloped land not far from Charleston. Its beaches, dunes, and especially its maritime forest stand in stark contrast to the overdeveloped hotels, rental properties, and condos that line much of South Carolina’s coast, and it becomes easy to recognize the criminal impact that development has had on coastal ecosystems. Before I digress into a rant, however (reread last week’s blog on baby raccoon dystopia for that), a final observation: one of my favorite aspects of this trilogy is the way the characters never quite fit in. They aren’t wholly likeable, and it’s on that basis that they form their attachments to one another — and to the reader. “Likeable,” after all, isn’t the same as “relatable.” Like Ghost Bird, I am introverted and detach into clinical analysis in times of stress; like Control, I have at times been at the mercy of others’ agendas without knowing what they are. In fact, it’s the characters’ inability to fit in with other humans that ultimately ensures their survival. The more they fight, try to impose their notions of the familiar onto the unfamiliar, the more likely they are to meet an unfortunate fate. Although some things should never be accepted as “normal” from a moral standpoint, other things — like nature — could stand to be a little more normalized. 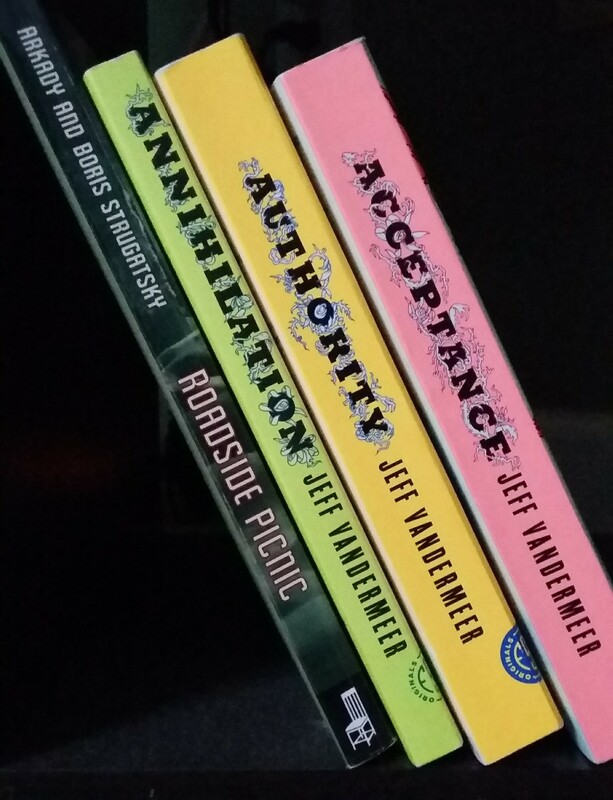 The Southern Reach trilogy is a good starting point for how. The benefit of being open-minded about your sons’ videogaming habits is that sometimes you find that gem of a book on which the game was based. I enjoyed METRO 2033 for this reason, and had been looking forward to the Strugatsky classic on which both the Tarkovsky movie “Stalker” and the videogame S.T.A.L.K.E.R. were based. Then he walked on the plush carpet along the hallway, which was bathed in the cozy light of hidden lamps. Here, it smelled like fancy tobacco, Parisian perfumes, gleaming leather wallets oversstuffed with banknotes, expensive call girls worth five hundred a night, and massive gold cigar caes. It stank of vulgarity, of the foul scum that had grown on the Zone, gotten rich by the Zone, fed, drank, and fattened from the Zone, and didn’t give a damn — and especially didn’t give a damn about what would happen when it gorged itself to its heart’s content, and all that used to be in the Zone settled in the outside world. The number of municipal disasters in Detroit increases sharply…. The number of deaths from flu epidemics jumps by a factor of two. Furthermore. The number of natural disasters in Detroit and its environs also increases. Tornadoes and typhoons, the likes of which haven’t been seen in the area since the 1700s, make an appearance. The heavens open, and Lake Ontario or Michigan, or wherever Detroit is, bursts its banks…. … we don’t notice things change. We know that things change, we’ve been told since childhood that things change, we’ve witnessed things change ourselves many a time, and yet we’re still utterly incapable of noticing the moment that change comes — or we search for change in all the wrong places. If you take a quick look at it, everything seems OK. The sun shines there just like it’s supposed to, and it seems as if nothing’s changed, as if everything’s the same as thirteen years ago…. Except there’s no one around: no one living, no one dead. He’d been awakened, horror-struck, by the same sound, mournful and drawn out, as if from a dream. Except that it wasn’t a dream. It was the Monkey screaming, sitting on her bed by the window, and his father was responding from the other side of the house — very similarly, with creaky drawn-out cries, but with some kind of added gurgle. And they kept caling back and forth in the dark — it seemed to last a century, a hundred years, and another hundred years. As much as I enjoyed the Strugatskys’ The Doomed City, I found Roadside Picnic to be just that little bit more accessible, even apart from its parallels, and more accessible also than the film “Stalker.” Like the Southern Reach trilogy, Roadside Picnic is about finding meaning outside of the trappings of human civilization — recovering our humanity in the face of alien influence. What are your favorite books about the weird and wonderful?